Modern churches often use a spiritualised, allegorical way of interpreting texts of the bible. Many Christians read the bible without realising that there are different ways of interpreting it. Perhaps the most common mistake is thinking there needs to be no interpretation at all, and the second mistake is in accepting ANY interpretation as equally valid. In fact, the method most conducive to sound doctrine, the one that has been the consistent choice of all well-grounded evangelical scholars for centuries is that of LITERAL interpretation. In other words, there is no need to look for, or force into the bible, a symbolic meaning when the literal words are quite plain. But scripture is not always totally literal. Jesus and the writers of the New Testament made reference to literal events but gave them a prophetic or symbolic meaning. (See Paul's treatment of the Red Sea Crossing in 1Cor 10:1-7) Therefore, beyond the literal interpretation, and parallel to it, there is often an underlying prophetic meaning, or spiritual application to the believer, especially in the Old Testament. The people of God came out of Egypt literally, but the spiritual application is that man must forsake the world in order to commit himself to the kingdom of God; therefore "Egypt" comes to mean " the world" throughout the bible. We often see the use of types and symbols in the bible where certain objects or events stand for certain truths, and these truths are consistent throughout the entire word of God. The lamb sacrificed in the OT worship was a type of the coming Lamb of God for instance. HOWEVER, the really important principle in biblical interpretation is that no new revelation or truth is established by the use of hidden symbols or allegory in the bible. Allegory, when it is found, merely CONFIRMS KNOWN TRUTHS that have otherwise been established on literal scriptures. For example, we would be justified in seeing the agony on the Cross foretold in this verse from Psalm 22 "Many bulls have compassed me: strong bulls of Bashan have beset me round." even though literal bulls were not involved in the crucifixion. Firstly the context of the psalm is one of prophecy of the Lord's death. Secondly, the surrounding verses are all consistent with the crucifixion; many were actually quoted by the Lord or other people in connection with his crucifixion. Thirdly, there is another established biblical principle that dovetails with this interpretation and confirms its meaning. That is, the prosperity of the highly-fertile Bashan district had become in OT days a symbol of selfish indulgence and arrogant pride, and was used in a derogatory manner (see Amos 4:1) and the wild bulls in the region of Bashan were known for their fierce aggressive manner, and are therefore a known symbol of merciless opposition. In other words, no NEW meaning is introduced into the New Testament scriptures by the use of the term "bulls of Bashan" because this term can be deduced by the literal and symbolic meaning ALREADY established in the rest of scripture. We would be perfectly justified in saying that bulls of Basham referred to in Psalm 22 were the jeering crowd who surrounded Jesus at his trial and death. This is a correct interpretation of scripture. Psalm 22 therefore only CONFIRMS known scriptural truths. The INCORRECT interpretation would be to establish a new revelation or doctrine by reading BACK into the term "bulls of Bashan" something that was not previously known to be there. For example, say we have a prophet whose teachings are being opposed by neighbouring church pastors. He might use the verse in Psalm 22 to support his own position, saying that the "bulls" are in fact "Baals" - idolaters and evildoers - that will surround the faithful of the last days church and attack them. This short article is not intended, however, to explore methods of interpretation, but to give just one glaring example of the worst kind of error. This error is rampant in the churches today, and most prevalent in the "prophetic" circles where almost any and every word of the bible is taken to be a symbol or allegory. Before looking at the way one prophetic writer deals with this scripture, let's take a quick look at the normal, classic interpretation, the one that gives a plain honest and reasonable meaning to the verses. This Psalm was intended to be used on the day of dedication of the new Temple. Some say it was used on the occasion of the Ark returning to Solomon's temple. According to Jewish writers the Ark was destined to be removed from the Temple and then returned through the gates at the time of the Second Temple; therefore it is a prophecy of the time of Messiah. The gates of the dwelling place of God (the "everlasting gates") are commanded to open to allow the Ark (typical of the presence of God, or the incarnate Messiah, ("God With Us") to enter in. He is worshipped as not only "the glory" of the Temple - the literal presence of God upon the Ark - but the ultimate KING of Glory, God himself in person. This God and King would enter in through the gates as mighty victor, to defeat all his enemies and establish his reign of righteousness. Psalm 24 was chosen by the rabbis as the "song of the day" for the first day of the week - the day on which Jesus rose from the dead! Sadly, the King of Glory did enter in at the gates but they did not recognise their Messiah, and crucified him. Therefore we look for a second coming, when the KING will return in glory to Zion and enter into his everlasting temple as described in the book of Revelation. "Lift up your heads": the head usually speaks of authority and also mentality/ understanding. You see, you and I are gatekeepers of the Kingdom, we are commissioned to bring men and women from the limited, finite life of the natural realm into the infinite eternal life of the unlimited heavenly realm. We must actively lift up our heads, raise our perception and understanding to the authority we have as gatekeepers. From the word 'go' this teacher reinterprets single words out of the context of the verse or psalm as a whole. Instead of accepting that "heads" has to do with the "gates" he gives a novel and unheard-of interpretation that certain people as "heads" or leaders are to be exalted! "Lift up your heads, O you gates! And be lifted up, you everlasting doors!" Yes, we are gates of heaven whereby people are brought to the eternal Life of the spiritual realm, but the Father also desires to exalt us as everlasting (eternal) doors whereby heaven is brought to bear in the earth. Yes, when we pray the prayer Jesus taught us to pray, "Thy kingdom come. Thy will be done in earth, as it is in heaven." (Matthew 6:10) we must understand that WE are the vessels through which He will accomplish this. 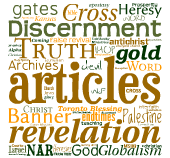 Notice here that a new and unwarranted interpretation is given to the words 'head', 'gates' and 'doors' in which these terms supposedly refer to ministers in the endtimes. Not only does this abuse the literal interpretation of scripture in the first place, but nowhere in the bible are gates or doors references to people EXCEPT in the case of Jesus who is (literally) the "Door to Heaven" (John 10:7-9). As you go to your workplace, school, home, market place, etc., you are a gatekeeper sent to usher people into the Kingdom. You are also a door whereby the Kingdom gains entrance to the workplace, classroom, etc. The word translated as doors, pethach in Hebrew, means to open wide, to loosen, break forth. The word translated as everlasting is olam in Hebrew, meaning time out of mind - past OR future, eternity. ...We are doors whereby the eternal purposes of God break forth upon the earth. A people not limited by the chronos (natural) time, but bringing the kairos (appointed) due-time of the eternal to invade and subdue the chronos, that the King of Glory shall come in. First, this teacher places an entirely NEW interpretation on the word gate or door; then on the basis of HIS own novel interpretation, he sets about APPLYING his own teaching to Christians. So he is able by this method to teach AS FROM THE SCRIPTURES, that Christians are doors that must allow the glory of God to flood the earth. He then moves on from his faulty foundation to erect another house of cards: one that says the glory of Christ is to appear here and now in a lastdays manifestation through believers. When Christ, who IS OUR LIFE, shall appear, then shall ye also appear WITH HIM in glory.· (Col. 3:4) The way that passage is worded in many translations, using when and shall appear, it is easy to mentally relegate it to a future tense. It is important to note however, that the word translated as when, hotay in Greek, really means WHENEVER; and the word shall is not in the original text. The Literal Bible translates that passage thus, "WHENEVER Christ is revealed, the life of YOU, then also YOU WITH Him will be revealed in glory".· Although yes, there may well be future implications, this puts quite a different light on it for the present tense . Yes, we are doors whereby the eternal King of Glory comes in WHENEVER Christ is revealed in our lives, as He reveals His glory / nature THROUGH us to bring His Kingdom to bear in our surroundings. It's always impressive when teachers state the Hebrew or Greek of a word and pretend to give the real meaning. This only works if the teacher intends to expand on the true meaning of scripture, not to CHANGE IT. In this instance, the meaning of a simple word and phrase is completely changed and obscured. At face value (the way we should read the bible) this verse in Colossians is a prophecy of the Lord's coming. Is it not? Read it for yourself in your own bible and note the context and surrounding verses. Heaven "above" where Christ sits in glory is contrasted with "the earth" isn't it? The two are not identical as the false prophet tries to teach! Nor is there any hint at all in this scripture that it refers to a present-day condition rather than a future event! Our spiritual lives and glory are "hid in Christ" not yet fully apparent because we do not have our glorious resurrection bodies as yet. But in that Day, when Jesus Christ returns from heaven above in his glory, then we will also be glorified in the resurrection! This interpretation is confirmed by scriptures such as: 1 Thess 4:16-18 and Phil 3:20-21. Again, an entirely NEW REVELATION is being presented by the twisting of scripture, to make it fit with a particular interpretation that is unsupported by the bible as a whole. CONCLUSIONS - Right and Wrong! "Let us lift up our heads that we may understand our authority as He lifts us up [exalts us] as doors through which the King of Glory comes in!" How he got from A to B on this one is hopefully a little more clear to you now, and a warning to any who are inclined to accept so-called bible studies and tapes of 'scriptural teaching' as valid. Without a good grasp of the correct methods of biblical interpretation many might applaud this man for presenting an exciting new view of our role in the endtimes! But now you have been warned, I pray you'll be able to spot and reject such false teaching and false methods of bible interpretation for yourselves.